If you are aged between 60-75 years and registered with a GP, cialis buy you should automatically be sent a bowel cancer screening kit every two years. 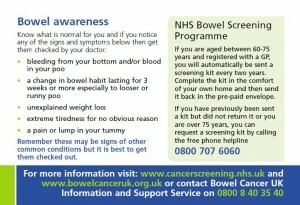 The screening process is designed to detect the early signs of bowel cancer. However, there it can only be effective if people take up the screening. 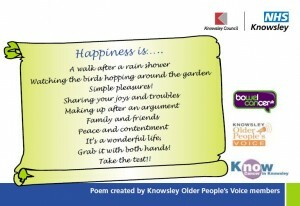 Only about 45% of Knowsley people in the 60-75 year age group use the kit. This is unfortunate as bowel cancer is the third highest form of cancer in Knowsley, and the borough has one of the highest incidence of the disease in the UK. It is easy to understand why people are sometimes reluctant to use the kit. 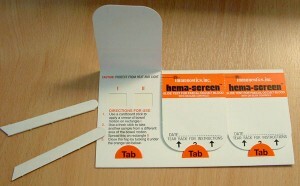 The screening process requires you to take samples of your ‘stools’, and to place these samples on a card. The card is then securely closed, placed in a pre-paid envelope, and posted to the laboratory for testing. However embarrassing and unsavoury this process appears, there is no doubt that the screening process can help save lives by detecting the disease early. There are KOPV members who are grateful that their condition was detected and they were able to receive effective treatment. Others have described the peace of mind afforded to them when they did the test and were found to be clear. KOPV has regularly worked with local NHS staff to raise awareness of the kits amongst our members, and to encourage people to complete the kit in the comfort of their own home and then send it back in the pre-paid envelope. We have even been involved in developing a set of promotional post cards reminding local people about the importance of using the screening kit every two years. Patients may experience one, some, all of these symptoms. It is also important to stress that any of these symptoms can be caused by other diseases. 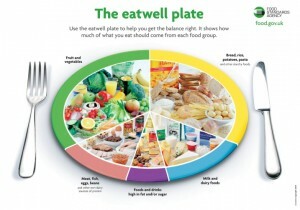 If you are worried about any symptoms you should see your GP.